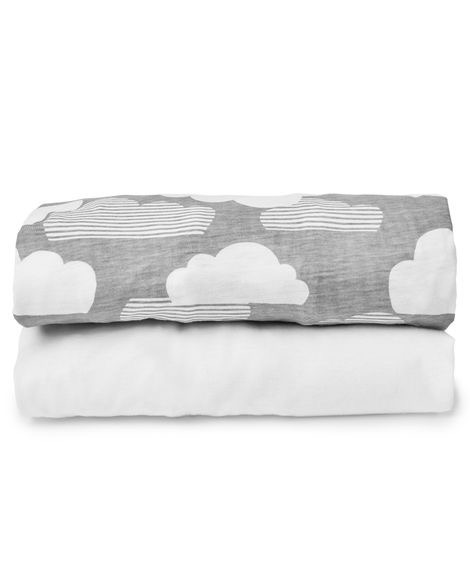 Article number: Skip Hop Travel Crib Fitted Sheet Set-Clouds/White-2 pk. 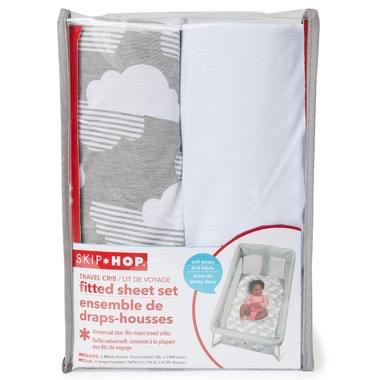 Sure to inspire sweet dreams, the Skip Hop travel crib sheet set is crafted from soft jersey knit fabric for baby’s comfort. The set includes two universal size fitted sheets and coordinates perfectly with your own travel crib or Skip Hop’s Play To Night™ Expanding Travel Crib. Universal fit works with most standard-size travel cribs. Size (inches): 38l x 24w; (cm): 96.5l x 61w. Machine wash & dry.